The Dublin player suffered the injury in action against Kildare tonight. 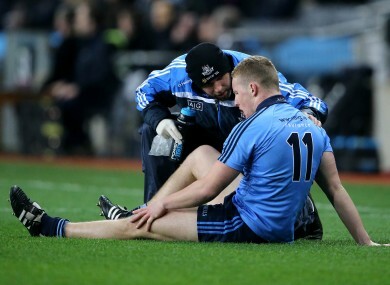 Ciaran Kilkenny is tended to by a Dublin medic. CIARAN KILKENNY WILL undergo a scan on his knee tomorrow morning to determine the extent of the injury he suffered in Croke Park tonight. Kilkenny limped off in the early moments of Dublin’s win over Kildare after colliding with an opponent near the Hogan Stand. The Castleknock player previously incurred a knee injury in last year’s league against Tyrone but did not suffer significant damage. Manager Jim Gavin is hopeful that the attacker will emerge unscathed as he gets set for the scan. “Ciaran’s in good spirits first of all, that’s the main thing. The medical protocols have kicked in and he’ll be going for a scan first thing tomorrow morning. Please God he’ll be okay. “He just got a bang to the knee. Another player made contact, pure accidental. It’s a contact game. It’s one of those unfortunate things. Hopefully it won’t be as bad as it could be. Email “Ciaran Kilkenny set to undergo scan tomorrow after suffering knee injury ”. Feedback on “Ciaran Kilkenny set to undergo scan tomorrow after suffering knee injury ”.